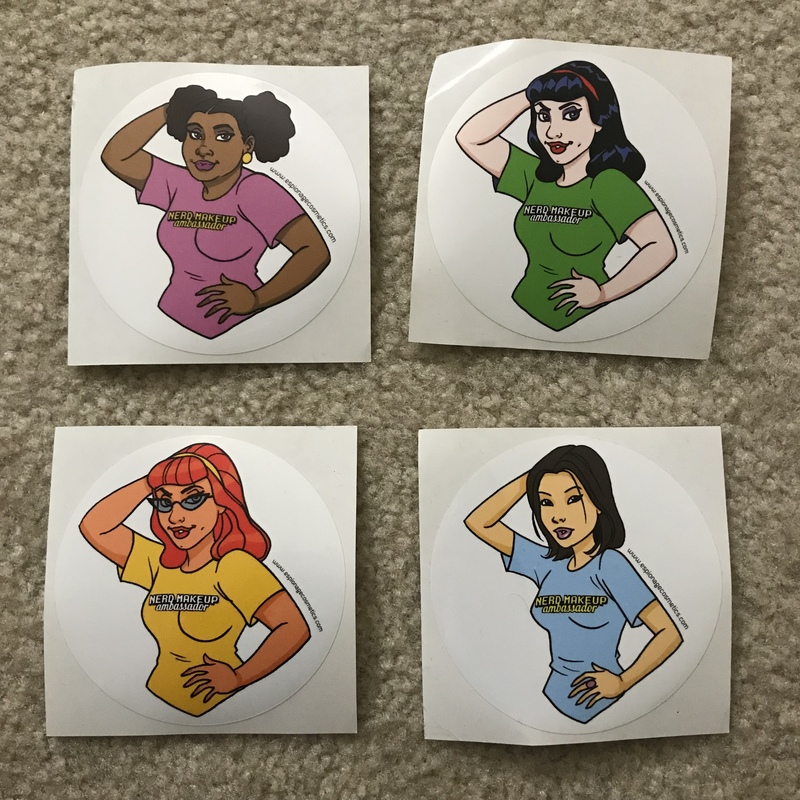 Fangirls, I love subscription boxes. So much so, that I went way overboard for subscription boxes in January. But something similar is grab bags, and I ended up buying two different ones in February. I wasn’t expceting much from either, but both surprised me in a great way. But this, the Espionage Cosmetics one, really blew my mind. I ordered the EC grab bag because it went on sale from $100 to $25. I don’t see it anywhere on the site now, but I was really excited about that price break, and ordered in a bit of a snap decision. But it arrived quickly; I recieved my EC grab bag only 10 days after ordering, and that was fantastic. In my bag (which was an actual bag inside of the box it was shipped in), was a ton of rad items. I’d like to go through those with you, and show the price of these items individually, so we can see just how much this box was actually worth. So let’s dive right in. 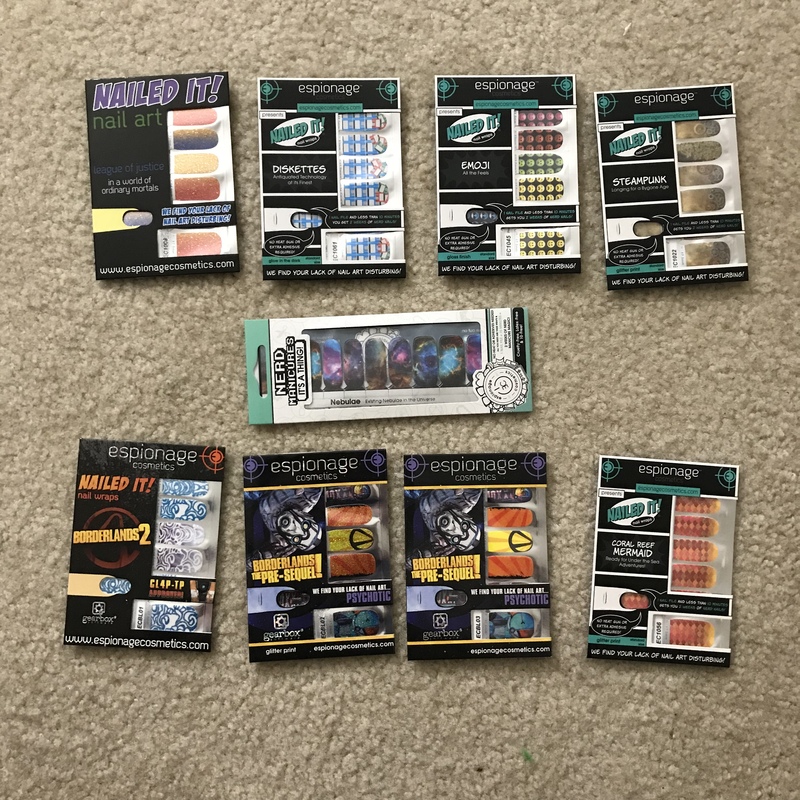 The first thing I noticed was the astounding number of nail wraps, I recieved nine sets! Three of those sets were Boderlands sets, which are licensed. That’s rad, and licensed items tend to be a bit more expensive, so those definitely up the price point. Licensed wraps seem to be in the $9-$12 range, so I’m going to clock these three at $11 each. There were also six non-licensed sets, which range from $8-$10. I’m going straight for the middle, and am estimating each set was worth about $9, making the total for licensed and unlicensed nail wraps $87! That makes it a $25 well spents, and we havent gotten through the whole bag yet! Next, I took out a black beanie. I’m not always someone who reahes for hats, but when I do, I grab a beanie. 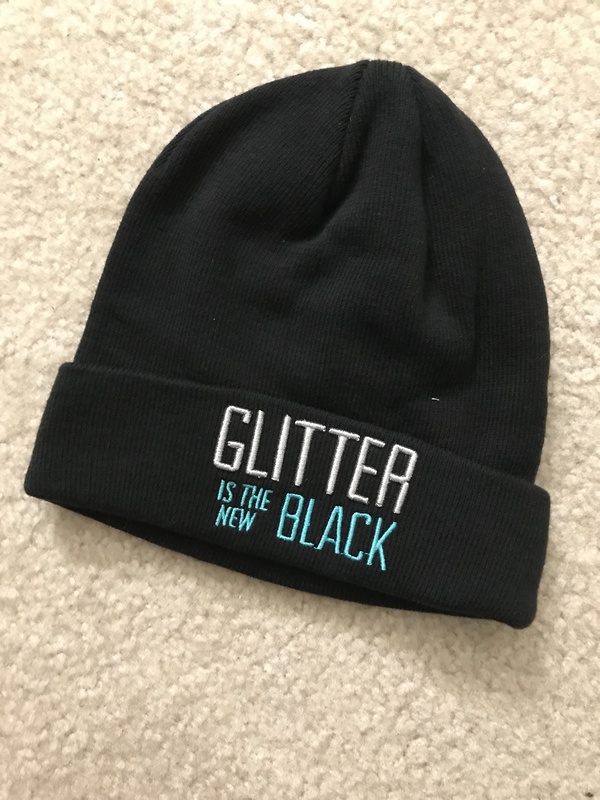 This super cute black beanie has simple text saying glitter is the new black, which seems to be one of Espionage Cosmetics’ tag lines. It’s cute, and I’ll be rocking it on bad hair days, and when the weather gets colder.This is a $15 hat, so my grand total is now $102. After that I pulled out what I thought was a phone case, but is actually a Nerd Manicure Humidor. 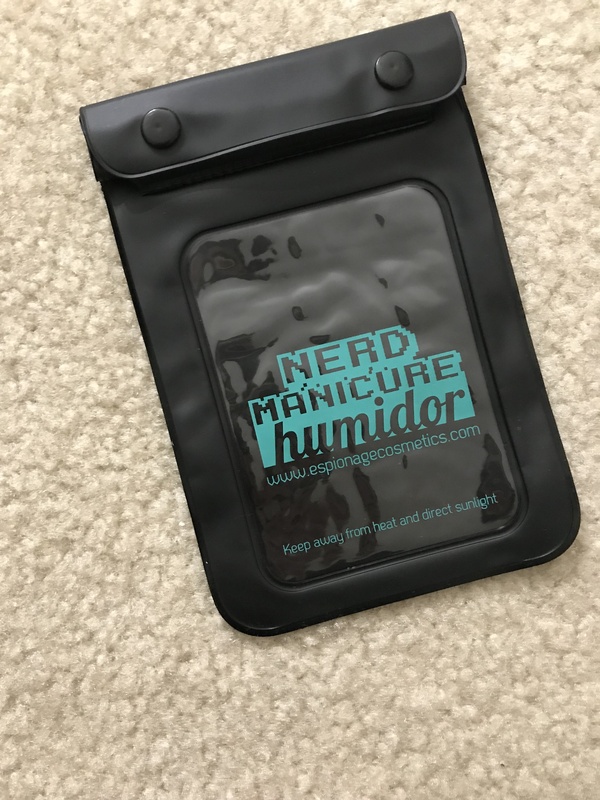 This is a little baggie for your partially used nail wraps. You know how you always have extra nail wraps? Well don’t worry about it with this guy! The humidor keeps your already opened wraps safe and free from weather changes. This is $7.50, so we’re now at $109.50. Then, I found a super cute bookmark! 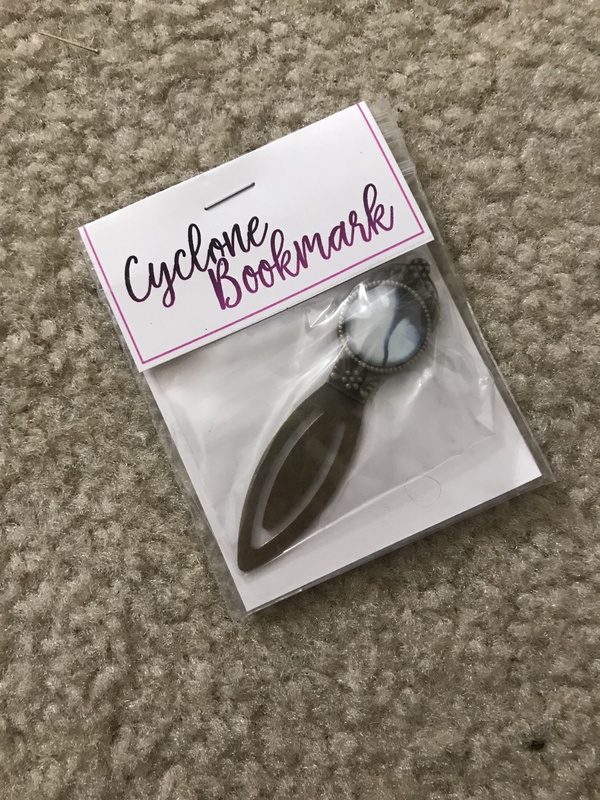 This cyclone bookmark is reminiscent of Dorothy’s tryip, and while it’s a bit heavy for me to use in books that travel with me, it’s perfect for books that I read only at home. This is a $10 bookmark, so we’ve made it to $119.50. I also got a clearly matte finishing nail polish. 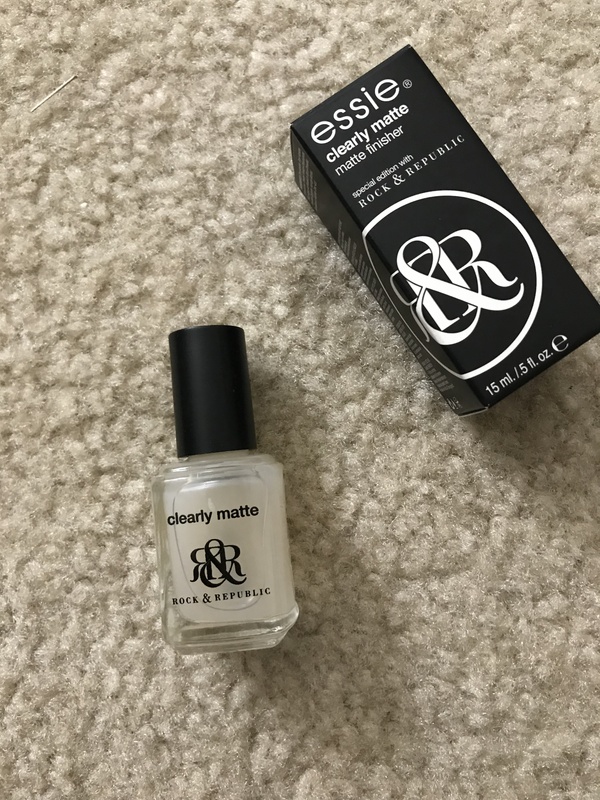 I was really excited about this, because I just tossed my old matte top coat, due to age. I found that this was $9, which I think is reasonable for a high quality nail polish. And our total is now up to $128.50. After that, I pulled out a loose pigment in the shade 1-Up. 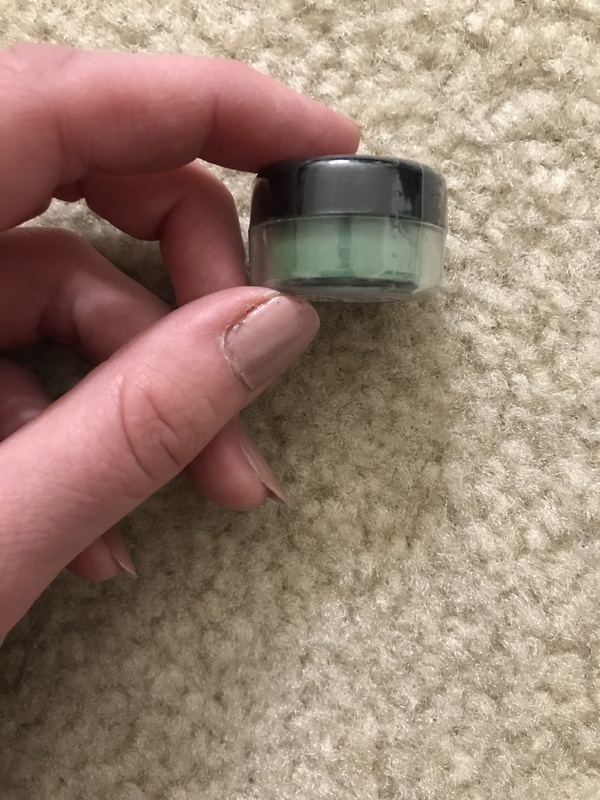 Loose pigments make me nervous, because they can be messy, and I don’t tend to use a good eyeshadow primer. I tried it out, because it does happen to be in a tone of my favorite color, teal. I definitely need to work on my application. This single pigment clocks in at $7.50, bringing out total up to $136. I also ended up with a pepperminty scarf, themed after My Little Pony! The stripey design looks a bit like a mane, and it’s the perfect size for a fashion scarf, even though it definitely won’t keep you warm. I think that’s perfect, though, as we reach the warmer months. I didn’t find this exact scarf, but a similar scarf was $12, so our total is now $148. I couldn’t get a good photo of it on it’s own, so check out the first image to see just how cute it is! Finally, I got some small items. 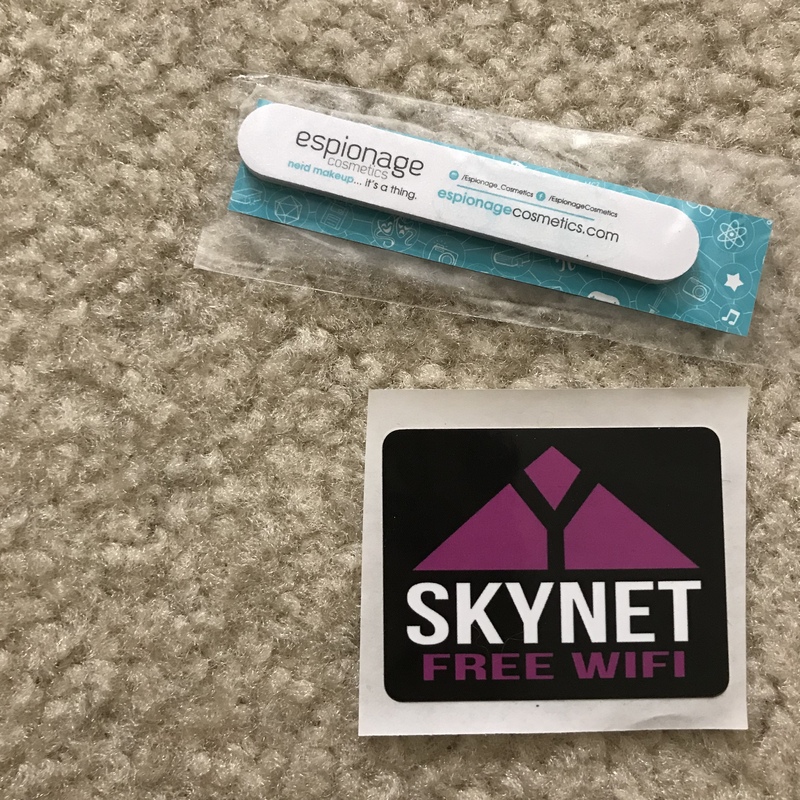 There were four Nerd Makeup Ambassador stickers, three different buttons, a Skynet sticker, and a nail file, plus the bag it all came in. I’d estimate all of that being about $5, so altogether, my box was worth at least $153! Looking at the nail wraps alone, I’m blown away. There was so much good in this grab bag, and I’m honestly so glad I jumped on this deal. Espionage Cosmetics is a brand that I trust, I adore their nail wraps and enjoy their eyeshadows, so of course I love this bag. 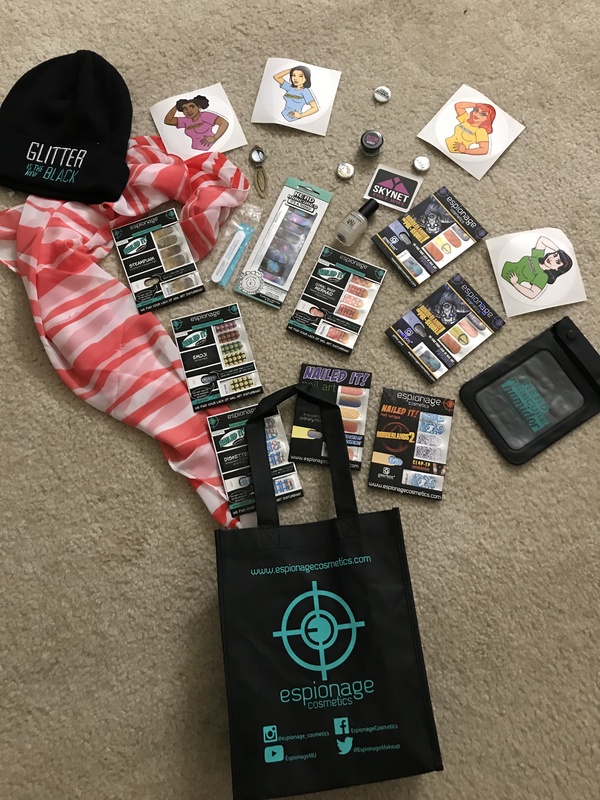 Did any of you get your hands on a grab bag? What was in yours? All images, characters, and logos depicted are copyright of their respective owners.